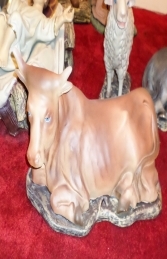 A traditional Mary kneeling with her head bent would complete your Nativity scene. Mary is wearing blue dress with lace around the neck and cuffs. She is wearing a shawl over her head. She is kneeling with her hands resting on one and another while looking on proudly at her new miracle. She would look great with your Nativity set watching over Infant Jesus in his crib. Why not add Nativity Joseph (JR 080083) and Nativity Baby Jesus (JR 080085).